Background: Exposure of the anterior cervical spine requires dissection in proximity to critical neurovascular structures. Monopolar electrosurgical (ES) devices generate heat in contacted tissues, resulting in thermal damage and temperature change. This study examined depth of thermal injury and temperature change associated with use of a low-temperature electrosurgical device (LTD) compared to traditional electrosurgery during a cadaveric anterior cervical discectomy and fusion (ACDF) dissection. Methods: ACDF was performed, using ES or LTD, on cervical spines (C3-4 and C4-5) from 2 fresh human cadavers with intact neck soft tissues and no history of surgery. Cadavers were maintained at 22–23°C, and fiber-optic temperature sensors (Neoptix, Québec City, Québec, Canada) were placed near relevant structures to measure changes during dissection. Depth of thermal injury was assessed by hematoxylin and eosin and Masson's trichrome histology of fixed tissue specimens. Results: Use of the LTD resulted in a statistically significant reduction in temperature change at platysma (3.0 ± 1.04 vs. 11.41 ± 3.10°C, P = .003), carotid sheath (7.32 ± 1.13 vs. 15.57 ± 2.56°C, P = .007), and longus colli (6.11 ± 1.32 vs. 12.9 ± 3.62°C, P = .016) compared to ES. Temperature change at the trachea was similar between groups (6.06 ± 1.99 vs. 4.96 ± 1.89°C, P = .528). Histology showed that LTD produced less mean and maximal depth of thermal injury compared to ES (mean: 0.5 vs. 1.2 mm; max: 0.9 vs. 1.8 mm; P < .05). Conclusions: The results of this pilot study demonstrate that anterior cervical spine exposure using an LTD reduces tissue temperature change and depth of thermal injury compared to ES. Clinical Relevance: Although exploratory, these results suggest that use of an LTD during ACDF may reduce the extent of thermal tissue injury during dissection. Future studies in live animal models are warranted to determine if thermal injury is a potential cause of common exposure-related complications, such as dysphagia and dysphonia. Anterior cervical discectomy and fusion (ACDF) is an effective and well-established surgical procedure for the management of symptomatic degenerative cervical disk disease. Although ACDF generally leads to good clinical outcomes and an arthrodesis rate of 95% at 2 years,1 the rare complications associated with ACDF can be debilitating or life threatening. These complications can include laceration of the airway, nerves, vasculature, and other structures; cerebrospinal fluid leakage; laryngeal nerve palsy; persistent swallowing or speech disturbances; bladder and bowel problems; and paralysis.2–5 Such complications may be transient or permanent, depending on the severity of the injury. Traditional electrosurgical (ES) devices are the mainstay of dissection and bleeding control during surgery, including ACDF. Despite their utility, the heat generated by these devices can cause unintended thermal injury to nearby critical structures and has been shown to impair wound healing, increase inflammation, depolarize nerves, injure vasculature, and lead to other adverse sequelae.4,6–8 Accordingly, novel ES devices have been developed that operate at lower temperatures—between 40°C and 100°C—compared to as high as 300°C for traditional ES devices. These lower temperatures can help to minimize thermal injury to critical structures during dissection and bleeding control with the ultimate goal of limiting the morbidity associated with electrosurgery. To our knowledge, the evaluation of low-temperature ES devices (LTDs) for ACDF has not been reported in the literature. Thus, the purpose of the present study was to determine whether a representative LTD could reduce heat transfer and depth of thermal injury in adjacent tissues during the ACDF procedure when compared to a traditional ES device. To this end, we used a cadaveric model to measure in situ temperature changes near critical anatomical structures that may be at risk during routine ACDF dissection. The depth of thermal injury was assessed quantitatively by histological analysis of harvested tissues. The LTD used for this study was the PEAK Surgery System (Medtronic Advanced Energy, Portsmouth, NH), which consists of the microcontroller-based, isolated output, PULSAR Generator and single-use PEAK PlasmaBlade tissue dissection devices. The representative ES device used in this study was the Valleylab ES pencil, button switch, and disposable (uncoated) metal blade electrode (Model E2450H) powered by the Valleylab Force FX generator (Medtronic Inc., Minneapolis, MN). Two human cadaveric cervical spines (C1–T3) with intact adjacent soft tissues of the neck were obtained from approved vendors (Anatomy Bequest Program, University of Minnesota, Minneapolis, MN). Both cadaveric spines had no history of muscular disease or prior surgery and were less than 120 hours postmortem. On the day of surgery, the cadaveric spines were acclimated to and maintained at room temperature (22–23°C) and prepped in the usual fashion. The standard for making accurate temperature measurements in an electrically noisy environment (as occurs with ES devices) is a fiber-optic temperature sensor. These devices exploit the property of crystalline materials, which have an optical reflectance that changes with temperature. An excited pulse of light of specific intensity is sent down the fiber-optic cable, and the intensity of the reflected signal is measured by the device so that the temperature can be determined. These sensors can provide real-time, continuous temperature measurements with no radio frequency interference and are therefore considered the standard for temperature measurement of energy-based systems. Fiber-optic sensors of various sizes (as small as <0.5 mm in diameter) are available and have been used in medical research studying ablation and surgical procedures.9,10 The Neoptix Reflex system (Neoptix, Québec City, Québec, Canada; Figure 1) was selected for use in the present study for its ability to provide real-time, reproducible measurements and for the availability of small probe sizes. Fiber-optic system. The system consists of the measuring unit (left panel) and the fiber-optic temperature sensor (right panel). The bare fiber-optic temperature sensor is 300 microns in diameter (right panel). Prior to each ACDF dissection procedure, the calibrated fiber-optic sensors were placed and secured at or close to critical structures (as close as 8–10 mm) during the ACDF dissection procedure. Placement was verified by fluoroscopy before continuing the ACDF dissection. Temperature at the sensors was measured continuously in real time as the procedure was performed. The ACDF procedures were performed on the cadaveric cervical spines (C3-4 and C4-5) under non–good laboratory practices conditions at Physiological Research Laboratories (Minneapolis, MN). Each cadaveric spine was dissected with both the LTD (set at Cut 6 mode, 20 W) and the ES (set on Cut mode, 25 W); the two devices were used on different sides of the spine, chosen at random. The procedure was carried out as previously described.11 Briefly, a skin incision was performed transversely to the level of platysma. The plane between the carotid sheath (laterally) and the esophagus and trachea (medially) was dissected and the omohyoid divided as necessary. The prevertebral tissues and any visible longus colli muscles overlying the anterior longitudinal ligaments and vertebral bodies were dissected, and an incision of the anterior annulus was performed. A vertical traction was placed on the vertebral bodies, and the cut annulus was removed, along with the anterior two-thirds of the disc. The osseous lips present on the superior and inferior vertebral bodies were drilled, and the disc was removed. The procedure was repeated on the contralateral side with the comparative ES device. Sections of platysma, carotid sheath, and longus colli were excised with scalpel after completion of the ACDF and temperature measurement phase, fixed in 10% normal saline-buffered formalin, and stained with hematoxylin and eosin (H&E) and Masson's trichrome. H&E stain was used for assessing basic tissue structure and inflammation: muscle and other tissues damaged by thermal application appear as bright pink with a hyalinized appearance compared to normal tissues that appear as lighter or darker pink. Masson's trichrome stain was used for identifying collagen, both new and old, along with muscle damage. Damaged muscle appears purple compared to normal muscle, which stains red. Tissue blocks (2 cm long by 4 mm thick) were trimmed, and the depth of thermal injury, defined as the width of the collagen and muscle damage perpendicular from the cut surface and into the tissue, was measured. Measurements were taken at 3 representative locations at each critical anatomical location for the 2 spines and recorded as the maximum depth of injury, the minimum depth of injury, and a middle depth of injury in millimeters. The mean depth of thermal injury was the average of the 3 measurements. This was a pilot study comparing the temperature changes and thermal injury caused by LTD and ES during ACDF; therefore, no formal sample size calculation was performed. Two cadaver spines were dissected, both with LTD and ES (1 side each), yielding an N of 2 for each device. Temperature change (mean ± SD) was calculated from 3–4 peak temperatures recorded from each device in each location in both spines while the devices were in use. P values comparing LTD and ES were calculated using an F test, then by a 2-sided t test for equal or unequal variance with a 2-tailed distribution. Confidence intervals at 95% were plotted as error bars for all data. P values <.05 were considered statistically significant. Maximum, minimum, and middle depth of thermal damage measurements (in mm) were taken at three representative locations of each anatomical location in both spines. The mean was the average of the 3 measurements. P values were calculated using an unpaired Student t test with a prespecified alpha of <0.05. The 2 cadaveric spines used in this study were 78 and 108 hours postmortem. Attempts to place calibrated fiber-optic temperature sensors were successful in all but 4 critical structures (the left and right transverse foramen close to the spinal cord, the vertebral artery, the superior laryngeal nerve, and the recurrent laryngeal nerve). The placement of sensors is provided in Table 1. Placement of temperature sensors in critical structures. The LTD generated a statistically significant reduction in temperature elevation at the platysma (3.0 ± 1.04 vs. 11.41 ± 3.10°C, P = .003), carotid sheath (7.32 ± 1.13 vs. 15.57 ± 2.56°C, P = .007), and longus colli (6.11 ± 1.32 vs. 12.9 ± 3.62°C, P = .016) compared to ES. Temperature in the trachea, however, was not different in the two groups (6.06 ± 1.99 vs. 4.96 ± 1.89°C, P = .528; Table 2). No change in temperature was observed in the spinal canal. Data for the esophagus were insufficient for analysis. Temperature changes in critical structures. Histological assessment by H&E and Masson's trichrome staining for depth of thermal injury showed that the LTD produced statistically significantly lower mean and maximum depth of injury in all tissues excised (mean: 0.5 ± 0.2 vs. 1.2 ± 0.4 mm; max: 0.9 vs. 1.8, P < .05) compared to ES. A reduction in maximum depth of thermal tissue injury was also observed in the platysma with the LTD compared to the ES (Table 3), but no statistical analysis could be conducted because only 1 ES tissue section was examined. Representative histopathologic sections of the different tissues are presented in Figures 2 and 3. H&E staining showing depth of thermal injury in the carotid artery and longus colli. Mature adipose, connective, and collagen tissues are stained dark pink, indicating thermal injury to the tissue, while lighter pink indicates no evidence of thermal injury. Upper panel: carotid artery. Lower panel: longus colli. Magnified 20×. Masson's trichrome staining showing depth of thermal injury in the carotid artery and longus colli. Adipose and connective tissue is stained darker blue, indicating thermal injury, while the adjacent lighter blue indicates no evidence of thermal injury. The damaged collagen is the darkest blue collagen at the top of the image. Upper panel: carotid artery. Lower panel: longus colli. Magnified 20×. This LTD has not yet been assessed in ACDF; thus, this pilot study was designed to evaluate and compare its properties with ES in a cadaveric model. First, we developed a method to measure changes in temperature within critical structures adjacent to the dissection using sensitive fiber-optic sensors. Using this method, we showed that the LTD resulted in at least 50% less temperature change in the platysma, carotid sheath, and longus colli, which are adjacent structures that could potentially be affected by dissection during an ACDF. Consistent with these measurements, histological assessment of these tissues showed a reduced depth of thermal injury with the use of the LTD. These results are in agreement with those obtained by Naruns et al16 and Ruidiaz et al18 in breast cancer surgery, in which the authors had shown reduced thermal injury to the margin of excised tumor tissue following lumpectomy. The present study has a number of important limitations. The sample size was small, consisting of only 2 spines. Although the cadaveric spines were maintained at room temperature, results obtained in unperfused tissues may not be fully relevant to results obtained in a live individual; for example, hemostasis was unnecessary in these specimens. In live patients, when the superior thyroid artery at C3-4 or inferior thyroid artery at C6-7 must be sacrificed, the dissection requires ES hemostasis. While this function may cause thermal injury on its own, in our experimental design, its potential effects could not be assessed. However, using human cadavers is the only way to determine histological thermal damage in ACDF because in living patients, no tissue is excised during this procedure except for a small portion of the disc. This is in contrast to tumor resection or abdominoplasty, in which tissues are excised and are therefore readily available for histopathological analysis of thermal damage. Histological analysis of the tissues was not performed in a blinded manner, which could have biased the measurements of the depth of thermal injury, and, finally, correlation of thermal injury to clinical complications was not possible in this study. However, it is possible that the differences in thermal injury in this study may correspond to clinically relevant nerve injury or dysphagia; these represent areas for further study. In conclusion, the results of this small, comparative temperature and histological pilot assessment suggest a potential benefit for using LTDs during ACDF because they produce less change in temperature and minimize thermal injury in dissected tissues compared with traditional ES devices. Further studies comparing LTDs to ES in living animals and in human patients undergoing ACDF should be performed to confirm these findings. Since histopathological analysis of live tissue in the dissection plane is not possible, the end points measured in these studies should include (1) temperature changes in situ during surgery (using fiber-optic temperature sensors); (2) outcomes including time to healing, scarring, and tissue necrosis; and (3) incidence of postoperative complications, such as dysphagia or dysphonia. The authors thank Kent Wika (Medtronic) for assistance with surgical procedures, Matthew Hoffman (Medtronic) for assistance with temperature measurements, and Jeanne McAdara, PhD, and Florence Paillard, PhD, for medical writing assistance. The authors wish to thank the individuals who donated their bodies for the advancement of education and research. Analysis of the three United States Food and Drug Administration investigational device exemption cervical arthroplasty trials. J Neurosurg Spine. 2012;16(3):216–228. Anterior cervical discectomy and fusion associated complications. Spine (Phila Pa 1976). 2007;32(21):2310–2317. Microsurgical anatomy of the superior and recurrent laryngeal nerves. Neurosurgery. 2001;49(4):925–932; discussion 932. Surgical complications of anterior cervical diskectomy and fusion for cervical degenerative disk disease: a single surgeon's experience of 1,576 patients. World Neurosurg. 2014;82(6):1380–1387. Vertebral artery injury in cervical spine surgery: anatomical considerations, management, and preventive measures. Spine J. 2009;9(1):70–76. Pulsed electron avalanche knife PlasmaBlade. Exp Rev Obstet Gynecol. 2010;5(1):19–22. Electrosurgery: history, principles, and current and future uses. J Am Coll Surg. 2006;202(3):520–530. Surgical cautery revisited. Am J Surg. 1984;147(6):818–821. Comparison of the thermal and histopathological effects of bipolar and monopolar electrosurgical resection of the prostate in a canine model. BJU Int. 2010;105(9):1314–1317. Quantifying electrosurgery-induced thermal effects and damage to human tissue: an exploratory study with the fallopian tube as a novel in-vivo in-situ model. J Minim Invasive Gynecol. 2010;17(1):70–77. Surgical Exposures in Orthopaedics: The Anatomic Approach. 4th ed. Philadelphia, PA: Lippincott Williams & Wilkins; 2009. Comparison of thermal coagulation profiles for bipolar forceps with different cooling mechanisms in a porcine model of spinal surgery. Surg Neurol Int. 2013;4:113. Thermal damage assessment of novel bipolar forceps in a sheep model of spinal surgery. Neurosurgery. 2010;67(1):166–171; discussion 171. Comparative healing of rat fascia following incision with three surgical instruments. J Surg Res. 2011;167(1):e47–e54. 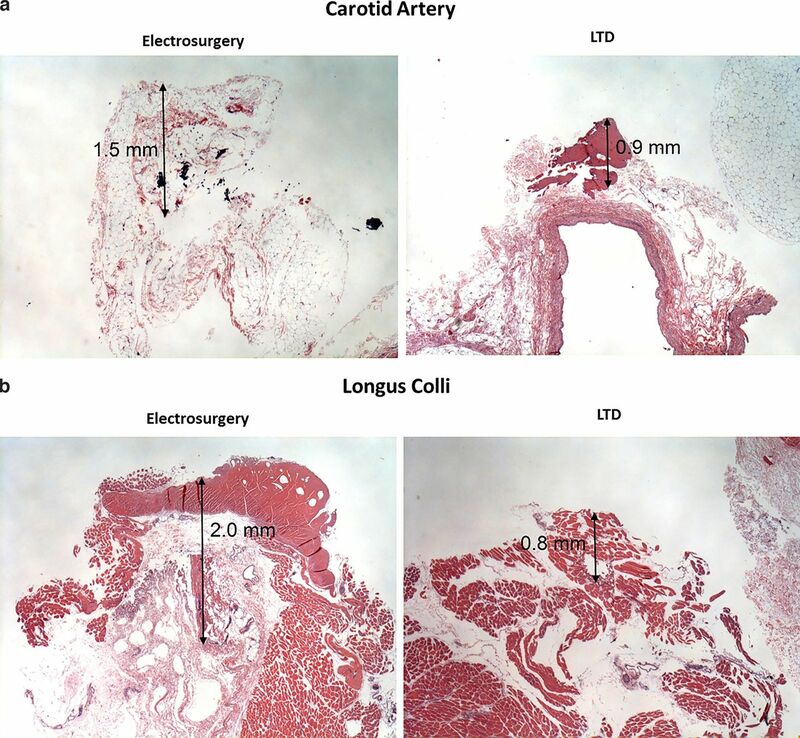 Comparison of the effects of surgical dissection devices on the rabbit liver. Surg Today. 2014;44(6):1116–1122. Quantitative comparison of surgical margin histology following excision with traditional electrosurgery and a low-thermal-injury dissection device. J Surg Oncol. 2011;104(7):746–754. Comparative healing of human cutaneous surgical incisions created by the PEAK PlasmaBlade, conventional electrosurgery, and a standard scalpel. Plast Reconstr Surg. 2011;128(1):104–111. A randomized controlled trial of the PEAK PlasmaBlade in open breast biopsy compared to scalpel and traditional electrosurgery. Paper presented at: American Society of Breast Surgeons 11th Annual Meeting; 2010; Las Vegas, NV. Comparative healing of surgical incisions created by the PEAK PlasmaBlade, conventional electrosurgery, and a scalpel. Plast Reconstr Surg. 2009;124(6):1849–1859. Traditional electrosurgery and a low thermal injury dissection device yield different outcomes following bilateral skin-sparing mastectomy: a case report. J Med Case Reports. 2011;5(1):212. An electrical plasma surgery tool for device replacement—retrospective evaluation of complications and economic evaluation of costs and resource use. Pacing Clin Electrophysiol. 2015;38(1):28–34.